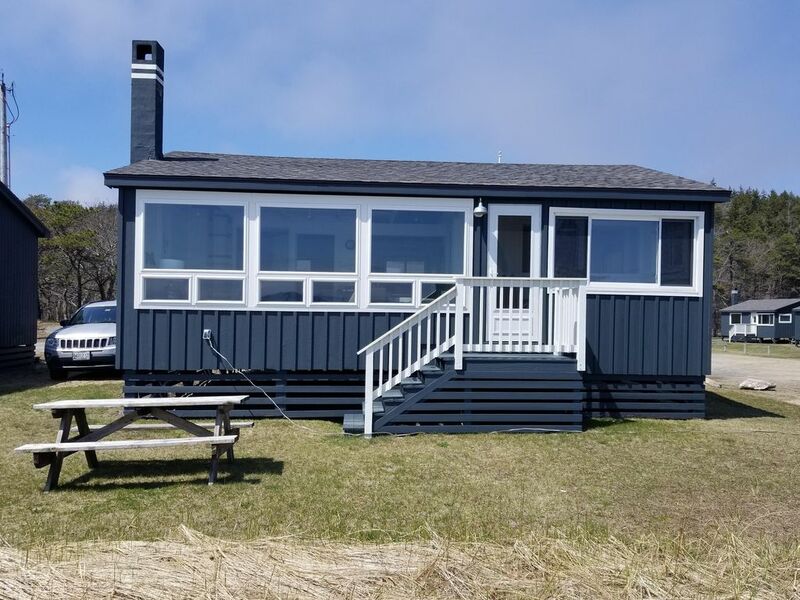 If you are looking to enjoy the beautiful Maine coastline, then this is the perfect vacation beach cottage for you. Located only 13 miles from historic Bath, Maine is this 2 bedroom 1 bath oceanfront cottage. You will witness breathtaking sunrises and sunsets with a star studded sky at night. This newly developed Driftwood community is an association with shared access. It is located only steps from the white sands of Popham Beach and Fort Popham is just a little more than a mile away. Please Note: Our association requires a 7 night minimum stay. May and October rates represent a three night weekend rate. Hello, I would like to introduce myself and let you know a little bit about me. My name is Beth Fox and I am the fortunate owner of this beautiful cottage located on the coast of Maine. I was born and raised in Maine where my family all still live. I have three children and six grandchildren. I live on a houseboat in Boston and work as an operating room nurse at the VA. I have the honor of taking care of the men and women who have served defending our country for all the freedoms we have. I love being near the water. I find the ocean to be amazing as it can be so calm one moment and so powerful the next. It is so relaxing in such a hectic world. I hope you enjoy this property. I have tried to make it as welcoming as possible. I hope the moment you walk through the door, you find a sense of calmness and peace. I think that the view alone will be worth the visit. It is absolutely stunning. It is such a great place for a couple or family. You get away from the city, sit outside at night and see the most amazing night sky filled with stars. When the tide is low, you can also walk out to Fox Island. What a great place to explore the beach and ocean in Maine. The bathroom has a rain shower head. The shower has high sides to get into it. If you have any mobility issues, it may be difficult. I have installed a hand rail to hold onto for getting in and out of the shower. Due to poor cell reception, I have installed a landline which can be used for local and long distance calling in the US. Want to get away from it all? Then this is the place to be. Centrally located between the beautiful sands of Popham Beach and historic Fort Popham with amazing water views is this adorable beach cottage. From the moment you walk in the door, you will have unobstructed views of the ocean. There are stairs that enable to you go down to the beach during low tide. During high tide, you can walk to Popham Beach if you like or just sit back and enjoy the amazing views while you bar-b-que on the grill. The historic town of Bath, Maine is only 13 miles away where you can enjoy quaint shops, seafood restaurants and watching ships come and go.